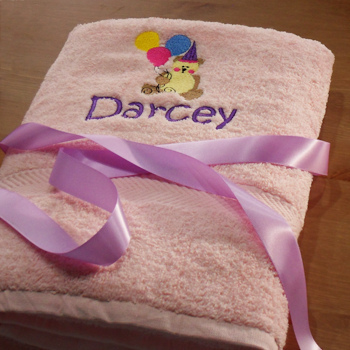 A bespoke embroidered bath towel gift! A bespoke embroidered bath towel gift! Choose the towel colour. Choose the embroidery design you like the best. A bespoke embroidered bath towel gift! Choose the towel colour. Choose the embroidery design you like the best. Choose the text. Choose the text colour. 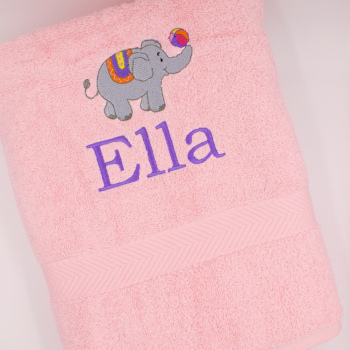 Amys Gifts will beautifully embroider your custom designed bath towel. Bath size towel made from soft ringspun cotton 75x125cm. Embroidery motif designs - Click the big green link under the picture to view these and make your selection. Please fill in what name to be added - be sure to check your spelling.